The Department is tasked with the main goal of protecting and preserving the Nation’s land. There are several different individual programs within the Land Management Department. Those programs are: Farming, Haying, Fencing, USDA Compliance, Prescribed Burn/Conservation, Specified Land Leasing, and Bison. Farming Program: This is the row crop portion of the Land Management Department (LMD). 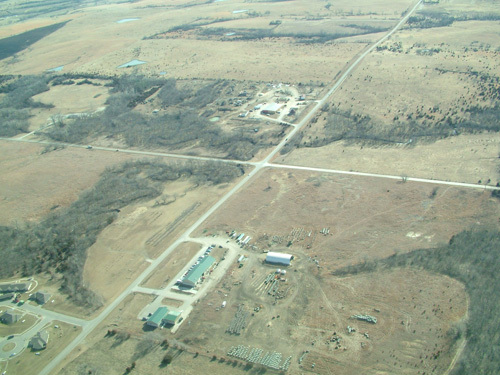 There are approximately 1,500 acres in this branch of the LMD. The department is involved in a two crop rotation of corn and beans. With the constant care and help from desirable weather conditions all harvested crops are hauled to the local distribution centers and sold at the highest market values available. Haying Program: The LMD harvests from 800-1000 bales of hay annually and haying procedures are used to ensure that the tribe’s bison program receives the amount it needs based on weather conditions. Extra bales are sold to other producers in the area. Fencing Program: The LMD builds or reconstructs fences on an as needed basis to contain the bison and for other property or right of way purposes. The LMD staff is trained and strives to continually update themselves on Tribal Laws & Ordinances and Kansas State laws. On average the LMD staff maintains anywhere from five to 10 miles of fence per year. The miles of pasture fence the Nation owns is typically a maintenance duty of the Lessee. USDA Programs: With compliance issues being a major part of the LMD there are ongoing contracts with the USDA (United Stated Department of Agriculture). Through the USDA the department is involved in CRP (Conservation Reserve Program), and other disaster relief programs through this organization. The department also is involved with the FSA (Farm Service Agency) and through this branch of the USDA the LMD receives monies to help improve HEL (Highly Erodable Land) through EQIP (Environment Quality Incentives Program). Prescribed Burn/Conservation Program: This program was established in 2011 and works in conjunction with the Bureau of Indian Affairs (BIA), local fire departments and other tribal nations. Its purpose is to clear and clean land (through regulation) by burning with the intent of rejuvenating pasture lands and natural habitats. When properly managed prescribed burning can create lush and healthy grasslands. In 2012 approximately 4,000 acres of land was burned. For a Bureau of Indian Affairs Individual Allotment Land Held in Trust to U.S. Government Burn Permit click here. For details call Rick Jones, Fire Prevention Technician-BIA Horton Agency at 785.486.2515. Specified Land Lease Program: During certain planting, grazing rotations or active lease expirations, the LMD holds lease land auctions for selected sites of the Prairie Band Potawatomi Tribal Tract properties under the approval of the Nation’s Tribal Council. These declared tracts are to be utilized “as announced” for leasing; changing the use of the tract is unacceptable. Prairie Band Potawatomi Nation tribal members are encouraged to take advantage of these agriculture, haying, or grazing leases when the auctions are held to promote the self sustaining of the Nation. Bison Program: The Bison Program, also known as the Buffalo Management Program is maintained by the Land Management Department staff. For the Elders’ Supplemental Meat Disbursement Calendar click here: 2019 Schedule. To download a Land Management Department brochure click here. Land Management Committee: Formed in 1998, the seven-member committee consists of an elected chairperson, vice-chairperson, secretary, and four members. The group meets once a month at public meetings at the Lands Management Department building.